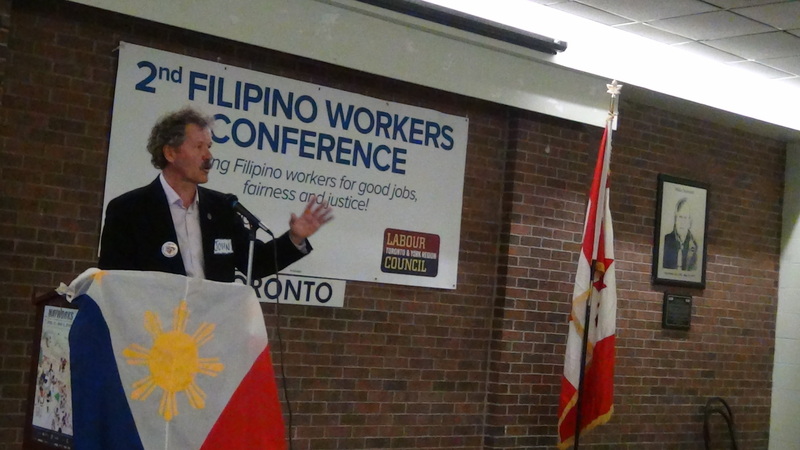 Snow and freezing rain in Toronto and the Greater Toronto Area did not deter 80 participants from attending the second Filipino Workers Conference on a cold Saturday in April 2018. Labour leaders, including Labour Council President John Cartwright, praised the contribution of Filipino Workers but cautioned that the fight for workers’ rights is under attack due to corporate greed. Organizing, joining and fighting for our rights and union solidarity are vitally important during these crucial times. If we fight for our rights, we will win! Luisa Blue, Service Employees International Union Executive Vice President, joined us from California and congratulated Ontarians on the recent success of the campaign for Bill 148, Fair Workplaces, Better Jobs Act. The minimum wage increase to $14 an hour in January of this year and $15 next year is the result of workers’ strong and united dedication to lift up working class families. Speakers Alex Banaag (UFCW), Bhutila Karpoche (NDP candidate in Parkdale-High Park) and Melisa Bayon (OFL) encouraged participants to build worker networks, demand full Pharmacare and elect pro-labour candidates in Ontario’s June election. The Filipino Workers Network (FWN) started with 20 members a few years ago and now has over 400 members from different unions. “When we stick together in a union, we all know that we benefit as a community and as a society.” Bringing different unions together enhances solidarity. 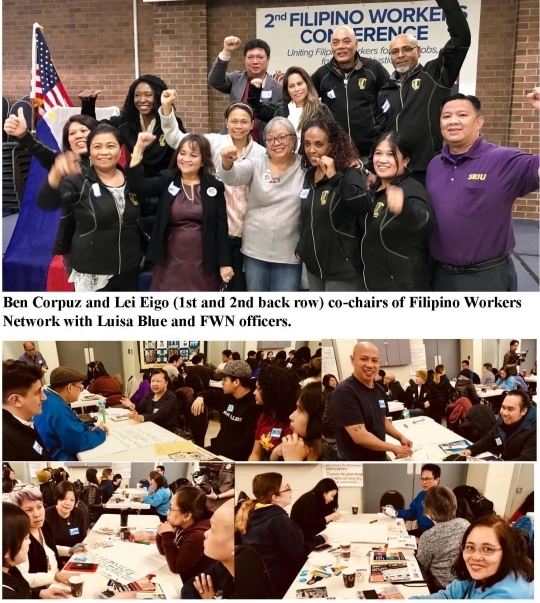 With close to 900,000 Filipino immigrants in Canada, FWN aims to serve as a collective voice for workers, connecting union members from different sectors for better wages, benefits and safer workplaces. The ethnically-mixed Asian community is becoming more prominent: The City of Toronto recently designated June as Filipino Heritage Month. But, in order to succeed, according to Union leaders, we must educate our members and learn from mistakes, organize and consolidate our ranks, mobilize and add new recruits. “More importantly, when workers’ rights are under attack, we must step up to the challenge and fight back,” said FWN Co-Chair Ben Corpuz.